The fingernails mainly protect your sensitive fingertips. However, with their delicate growth process, the nails are responsive to changes in the subjects psyche or physical health. Fingernail ridges can form if there is something unusual going on. Horizontal ridges (grooves) on all the nails can suggest a change or interruptions in the individual’s health possibly due to severe dieting, long-term stress, acute infections, injury or trauma. Vertical grooves can occur with old age, but on a young person, they can show a delicate constitution, nervousness, stress, hormonal changes or poor nutrition. If all the nails have the ridges, it could also be due to rheumatoid arthritis or overuse of nail polish removers. 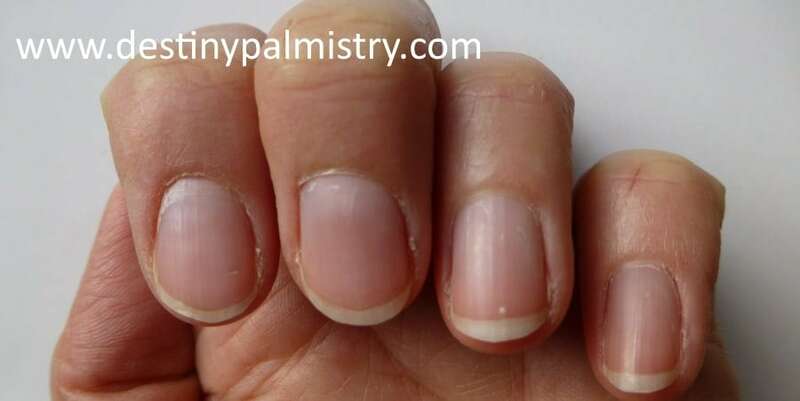 The cause of flaky nails can be a mineral imbalance, poor diet or an underactive thyroid gland. Using bare hands for work such as gardening and overuse of chemicals on the nails can also cause brittle and weak nails. Long-term stress shows as dry skin on the palms, which would also affect the nail. White spots can show a vulnerable nervous system and can appear during times of stress or when the body is lacking in a certain mineral such as calcium. Black or red lines, however, can indicate a much more serious condition affecting the heart or blood. The humped nail, commonly associated with weak lungs, respiratory disorders such as emphysema, bronchitis or pneumonia. Long-term smokers often have nails that grow over the tip of the finger, appearing curved or humped (suggesting inadequate oxygenation). A severely humped nail, where the tip appears swollen, indicates a more severe condition. A claw-like nail is frequent in the hands of older people who may have a problematic or dominant attitude. If there are no respiratory or age-related issues, these people are tenacious, but with a pompous attitude. The concave nail is opposite of the humped nail and appears dished and sunken in, like a spoon. It can be a sign of a lack of energy or physical stress. There may be nutritional deficiencies or exposure to a lot of water or chemicals which soften the nail. The concave nail can be a warning of a more severe oncoming illness. A nail usually takes six months to grow from the root to tip, subsequently, some markings can be timed based on where it is on the nail. As an example, a horizontal ridge half way along the nail would suggest a change around three months ago. Timing events from the life line. Health and stress indicators from the hands. More important information about the life line.